Reine DuBois has been working as a naturopath and homeopath for over 15 years and her skills may be all you need. The team at zen10 has worked closely with Reine to produce a new dynamic website to replace the old static html website. 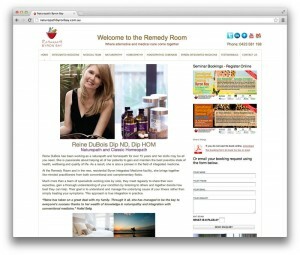 The simple design allows users to browse the services that Naturopath Byron Bay provide with ease. The new website was built using custom WordPress template development allowing Reine to manage the website herself. Like the majority of the WordPress website’s we develop, the new site includes an online enquiry form, dynamic sidebar and navigation areas.